For 2018, the more affordable Kawasaki Ninja 300 for India remains unchanged on the design front. However, it does get new colour additions - Lime Green and Blue and new graphics too. The KRT edition though has been discontinued. The semi-digital instrument cluster has been retained as well. 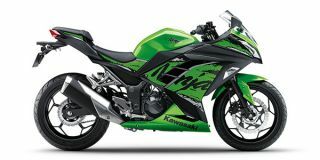 With the new price of Rs 2.98 lakh, the Ninja 300 is also Rs 62,000 cheaper than the earlier CKD model it replaces. That said, only the frame and the engine comes from Thailand now. The body panels, alloy wheels, tyres and brakes are now made in India. While tyres have changed from IRC to MRF Zappers, they are still not radials.